Thai cuisine is famous for its coconut milk based hot curries. This is one flavor of them. Lightly heat oil in a heavy bottom vessel. Add the Thai curry mix to the oil. On a low flame keep stirring for 5 minutes. Add the crushed ginger, 3 to 4 baby red chillies and chopped lemon grass to the masala. Gently mix and simmer. Cook till the vegetables are almost done. Do not overcook the vegetables. Lastly add coconut milk,it will give consistency to the gravy,depending on how thick or watery you want it. Serve hot with steamed rice or mushroom rice. Here is the recipe for Green Chicken (serves 2) Ingredients 500gms Chicken Bunch of Coriander Leaves( handful ) 2 Medium size Onions 3 Green Chillies 20 Pepper Corns ( Black Pepper ) Ginger - Garlic Paste 2 tsp Salt to taste Directions: Wash and marinate the chicken with salt and ginger garlic paste for 10minutes, meanwhile grind the rest of the Ingredients and add to chicken marinate well. pressure cooker it for 3-4 whristles. ( Don't add water to the Mixture) serve the gravy with Rice or Chappati's. recipe should be simple enough to follow at home, from where should we get the thai curry mix etc, its better then we order the chicken curry from outside, what you have done is just use the ready made curry mix and made this curry. 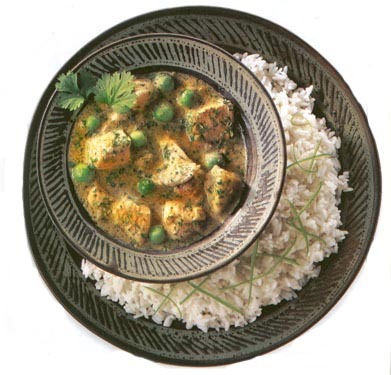 I really wanted to know a simple green chicken curry, please tell me, I would be very grateful to you.